Sometimes pageantry becomes more than symbolism and crosses over into the realm of substance. 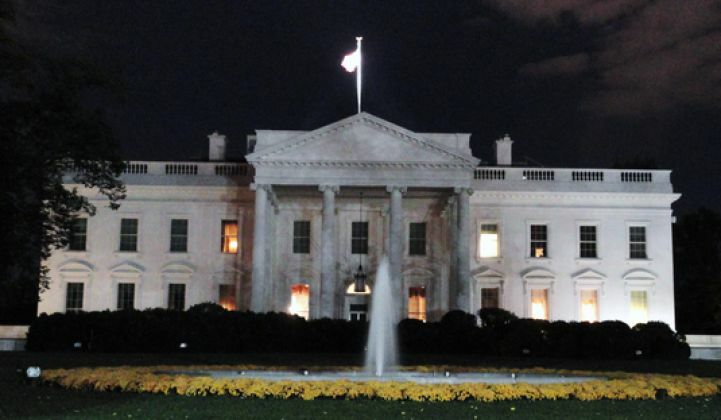 That may be the case for the White House's public embrace of energy storage. In a summit Thursday, the Obama administration announced a host of policies, investments and project commitments aimed at supporting "1.3 gigawatts of additional storage procurement or deployment in the next five years" and a cumulative $1 billion in energy storage investment. Storage will assist President Barack Obama's goals of fighting climate change and modernizing the grid by smoothing the integration of renewable energy and creating resilient backup systems. "Adding a nationwide public-private storage push into the equation will provide a well-earned boost to the market, and in all probability, an upward bump in the storage outlook," Ravi Manghani, energy storage director at GTM Research, wrote in a brief on the announcement. "The market will receive a direct lift from the program investments, and additionally surge due to positive network effects from a well-funded and expanding industry ecosystem." Here are the key components of the new programs. In its bureaucratic verbiage, the General Services Administration "announces that it intends to issue a Request for Information about building-level energy storage." The GSA is interested in a cleaner alternative to diesel generators for emergency backup. Assuming the organization follows through on its intent to find out more, and then actually builds energy storage, this could lead to some significant new capacity. After all, the GSA manages 376.9 million square feet across 9,600 buildings on behalf of the government. Some of the most concrete action items come from the Navy and Air Force -- they actually have hard numbers and specific sites for new storage projects. Naval Weapons Station Seal Beach in California will work with a third party to develop a 50-megawatt to 100-megawatt grid-scale battery project. Elsewhere in California, Naval Base Ventura County will get a solar-plus-battery system to provide most of the base's peak load for three hours in the event of a blackout. And in an intriguing case of adaptive reuse, Naval Support Activity Crane in Indiana will take old submarine batteries and turn them into distributed energy resources. They predict that using the old batteries this way would expand the Navy's battery capacity to 44 megawatt-hours by 2019. Meanwhile, the Air Force announced storage projects at three different bases, with a particular focus on ensuring the energy access for critical functions. A particularly exciting initiative is the Forward Operating Base of the Future project at Joint Base San Antonio, which aims to cut the fuel needs of forward operating bases by 85 percent. Reducing fuel dependence in the field makes the logistics of the operation much simpler and saves a lot of money, too. Up in Fairbanks Alaska, the Navy's Office of Naval Research will fund an effort to develop cost-effective, renewables-powered microgrids for remote communities in the Arctic. Sixteen utilities and power companies threw their hats in the ring. Some of these commitments are a few steps removed from really doing something, but several had specific action items. Duke Energy said it would install 5 megawatts or more of storage around Asheville, North Carolina as it works to close all coal plants in the area. The Los Angeles Department of Water and Power will establish 24 megawatts of energy storage this year and shoot for 178 megawatts by 2021, with even bigger goals for demand response. NextEra Energy's Florida Power & Light will test a slew of different battery applications in real-world settings like the Everglades, Miami residences, and the 2017 Miami Open tennis tournament. The White House also included commitments from 17 private-sector companies involved with storage. One might question the usefulness of reporting that the energy storage industry promises to work hard on energy storage. Chances are they had that in mind before the White House called a summit. In any case, they will resume their labor with the imprimatur of the nation's highest office.